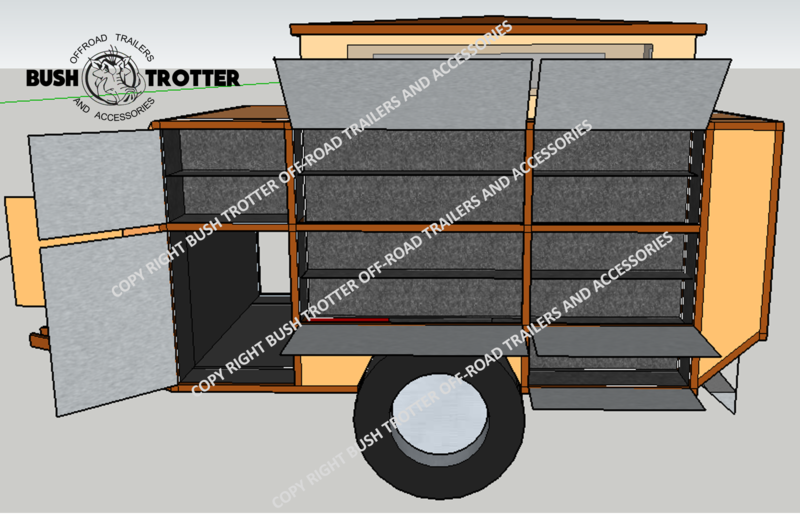 Bush Trotter camping trailers are designed to be practical, robust “go anywhere offroad trailers”. 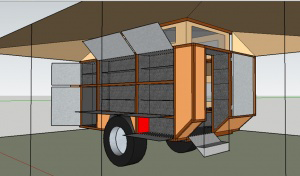 A camping trailer designed by campers for campers. 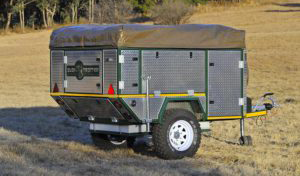 Development of the Piglet off road camping trailer started in 2007 and after extensive testing the first trailers rolled off the production line in 2010. Bush Trotter camping trailers are built on an extremely robust chassis, with the “a frame” being part of the chassis design and supported by the nose cone structure. 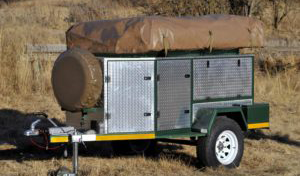 This combined with a steel frame clad with floating aluminium panels ensure the necessary flexibility enabling the Bush Trotter to tackle even the harshest offroad terrain. Accessibility to the functional interior storage spaces, are provided by ample aluminium doors, all with “one key fits all” locks. The tents and awnings are manufactured from “rip stop” canvas, and are designed to ensure optimal ventilation, ease of use and durability. The Piglet is a 3210 x 1760 x 1550 mm camping trailer with an intelligent power management system. 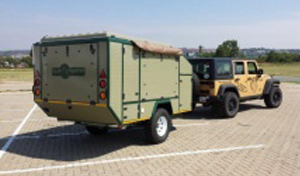 The Warthog is a 3590 x 1760 x 1580 mm camping trailer with a trailer tent which can support up to 4 people. The Bosvark is a 4500 x 2120 x 1885 mm camping trailer with two double beds which includes a tent and mattress for each bed. The Hippo is a 4500 x 2120 x 1885 mm camping trailer with one double bed which includes a tent and mattress for the bed. "Take vacations, go as many places as you can. You can always make money. You can’t always make memories." These camping trailers are ideal for your next 4X4 trailer adventure. 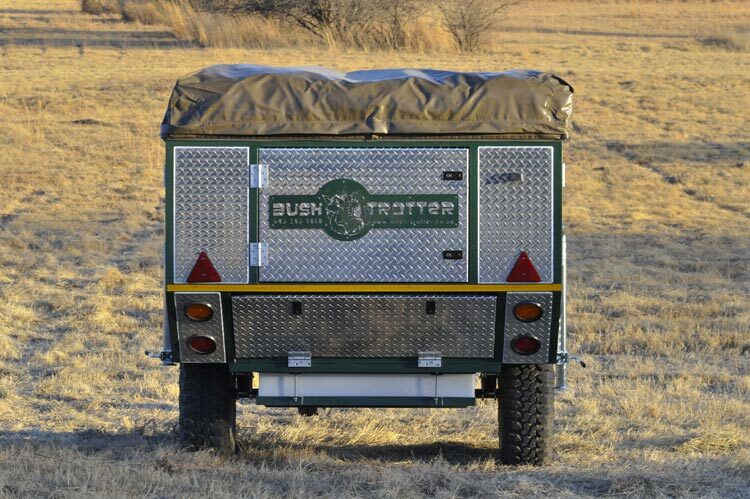 Bush Trotter camping trailers are designed to be practical, robust “go anywhere offroad trailers”. Bush Trotter camping trailers are built on an extremely robust chassis, with the “a frame” being part of the chassis design and supported by the nose cone structure. This combined with a steel frame clad with floating aluminium panels ensure the necessary flexibility enabling the Bush Trotter to tackle even the harshest offroad terrain. "Time camping isn’t spent, it is invested..."
Ready to start your next adventure? Great, so are we. "When life gets complicated, I go camping..."
"Log off, shut down, and go camping." © Copyright 2018 Bush-Trotter. All rights reserved.